Just look at that view! 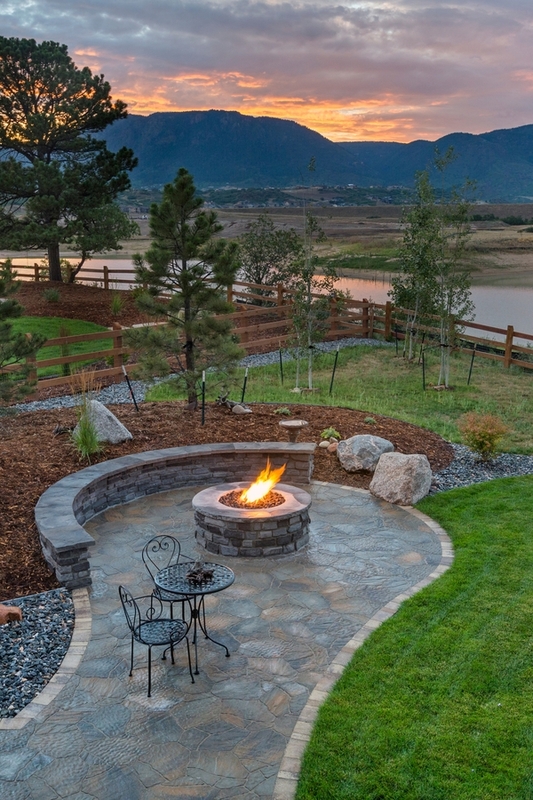 Are you ready to get your patio back in tip-top shape for the warmer weather months? We are too! 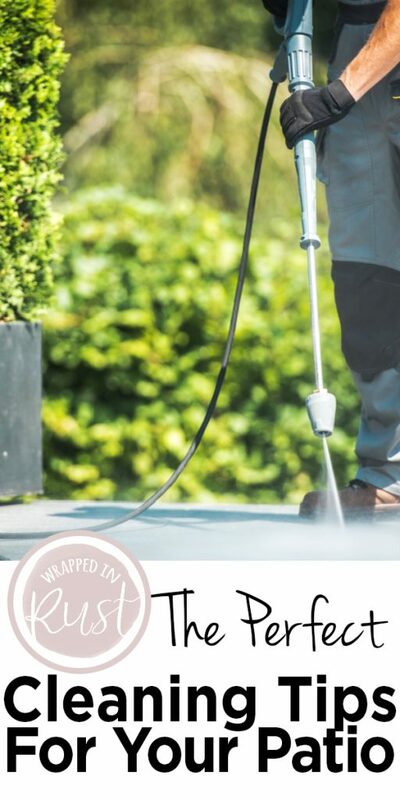 So today’s post has the perfect cleaning tips for your patio. No matter what sort of patio you have, we have the cleaning tips you need to get it looking fine. Once you’re finished, all that’s left is to kick back, relax and enjoy the evenings. Alright, first things first. Clear the patio of anything and everything obstructing your access to every square inch. That means the furniture, garden containers, barbecue grill, etc. 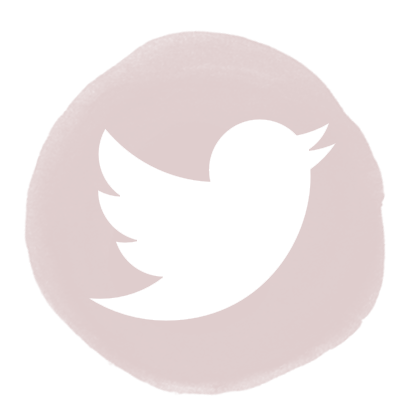 Clear everything away and start with a blank slate. Now that patio, no matter where it is in your yard or what it’s made of, needs a good, thorough sweeping. Grab an outdoor broom made for rough surfaces. Your indoor kitchen broom isn’t up to the task and will take you much longer. Thoroughly sweep the entire patio of all the loose dirt and debris. 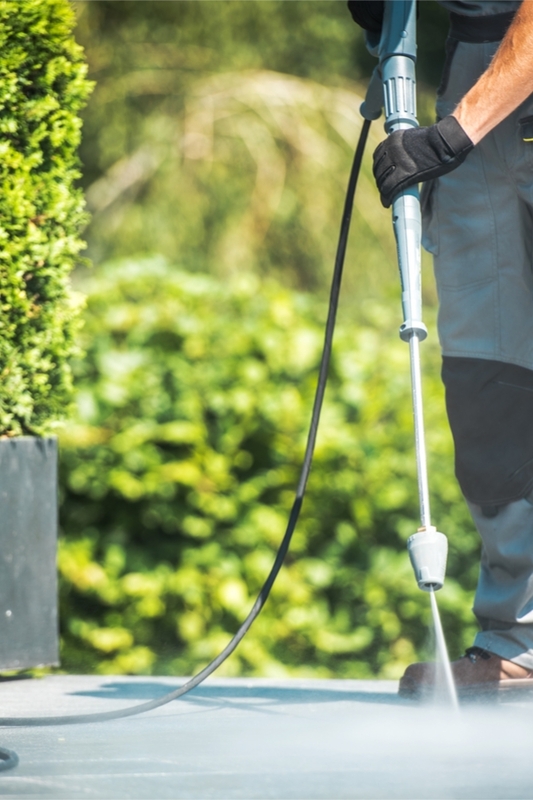 If you have a pressure washer, it makes it easier to clean stains and stuck-on dirt, mold and mildew from your patio. But know that there are other ways to accomplish the same task. We’ll talk about that in a minute. Don’t feel like you have to purchase strong chemicals to get the patio clean. You really don’t! A great DIY solution can come right from your kitchen. Mix a half-cup of baking soda into a gallon of warm water, and stir to dissolve. For a little extra cleaning power, add a few drops of dishwashing liquid to the water and baking soda mixture. You can safely use this in your power washer. See our post on 7 chemical-free cleaning solutions that are tough on grime. You don’t have to use a power washer. A long-handled scrubbing-brush works well, it just requires a little more elbow grease. If you do use a chemical cleaning solution, such as bleach to remove mold, be sure to cover up adjoining plants with plastic sheeting or a tarp. All adjoining grass and plants need to be protected from harsh chemical cleaning solutions. 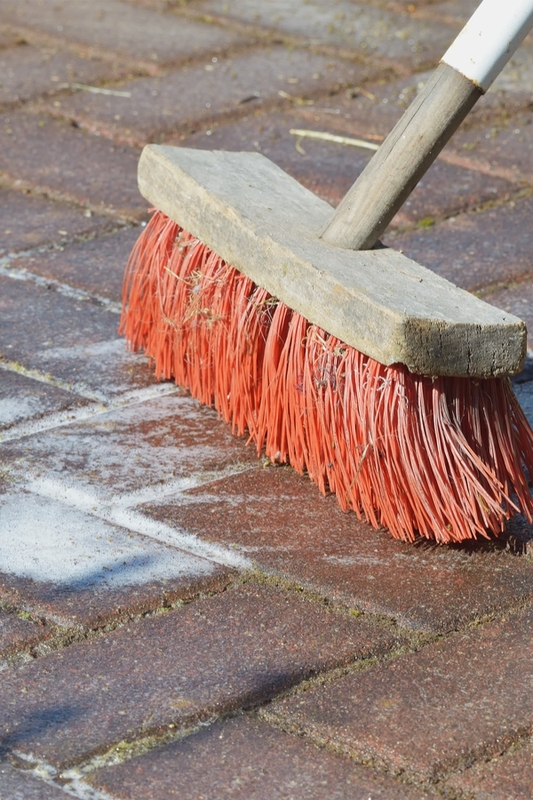 A long-handled scrub brush is actually a better choice for cleaning pavers or stone patios, so if this is your patio, you don’t need to worry about getting a power washer. After you scrub away any stains, mold, and/or mildew from your patio surface, it’s time to rinse. Once again, you can use a power washer with lots of fresh water. You can also get out the garden hose. Either way, thoroughly rinse off the patio off all cleaning solution. Save these cleaning tips for your patio for next year, but until then, get out and enjoy your sparkling clean patio!